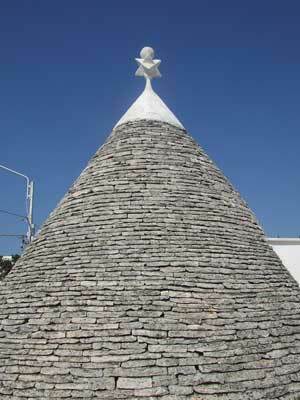 A trullo is a small dwelling built from the local limestone, with dry-stone walls and a characteristic conical roof. It is a traditional and simple type of structure which you'll see dotted around this part of Puglia, sometimes in its most basic form used as a kind of shed among the olive groves. The story behind Alberobello, once a town of trulli alone, is a typically Italian one: its design was to fiddle taxes and fool the authorities. The local feudal lord, Count Acquaviva, moved his peasant workers here to clear woodland and cultivate the land. To wriggle around laws and taxes, it was important that Alberobello didn't class as an inhabited settlement. 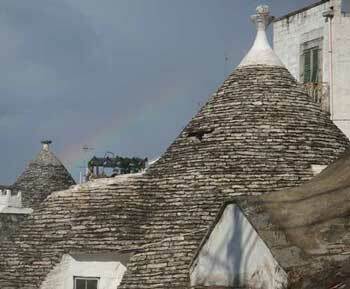 So until 1797, when Alberobello was finally given 'town' status, the people had to live in trulli, which could be dismantled in a hurry when necessary. The buildings are usually square and have very thick stone walls, constructed without mortar. The thickness strengthens the structure and also helps regulate the internal temperature. The roof is actually a dome, as you can see when you enter one of the buildings, but is almost invariably built up on top into a cone shape, topped with a spire. There is generally a central room, with additional living spaces in arched alcoves. Residential trulli are smartly whitewashed, and their roofs are often decorated with fanciful painted symbols supposed to have religious or superstitious significance. The fanciness of the spire decoration was something of a status symbol: it showed the builders' skill and thus the spending power of the owners. Frequently the houses consist of more than one trullo roof: they are more like trullo complexes crowned with several roof-cones. The centre of Alberobello is mostly composed of typical small-town Italian streets and buildings, with a few trulli interspersed among the buildings in a surreal fashion. Some older back streets are lined chiefly with residential trulli. The most picturesque parts of Alberobello, though, and the strangest, are the two areas composed almost entirely of trulli; over a thousand of them. Here the little white pointy-topped dwellings are clustered together like a hobbit town. The most touristy part of Alberobello is Rione Monti, a district on a slope facing the modern town centre. It consists of several narrow lanes sloping upwards, with others winding along the hillside, and is extremely picturesque both from afar and close up. Walking around is enjoyable, but be prepared for constant welcomes from the local vendors sitting outside their trulli shops and bars. You'll find colourful terracotta whistles (a local Puglia thing); some simple local ceramics; trullo snowstorms; sliding pens; and everything possible shaped like a trullo, from moneyboxes, to silver jewellery. Many buildings contain tiny 'bars' where you can sample local wines, which are also sold in the tourist shops along with biscuits and pasta. Although the area is obviously one big tourist trap, the prices aren't extortionate: there's too much competition. The owners will try to entice you in with all sorts of claims and promises: the oldest trullo, a trullo with a well, an inhabited trullo, a panoramic terrace, free wine and liqueur tasting. Especially if you don't have the chance to stay in a trullo, accept the low-key sales pitches and enter to have a look around. You will be able to see some interiors, and the panoramic terraces do have good views. Heading up Via Monte Michele beyond the commerce, the explorer reaches Alberobello's twentieth-century trullo church, the Chiesa di Sant'Antonio. The second trulli district is called Aia Piccola. This is very different to Rione Monti and is less visited by tourists. It is still a residential area, with quiet lanes lined with little inhabited trulli, one of which we were invited into by two friendly old men. The rest of Alberobello is mostly 'normal' buildings but with trulli popping up picturesquely here and there. Behind the large town church, the Chiesa dei Santi Medici Cosma e Damiano are small lanes of trulli leading to Trullo Sovrano. 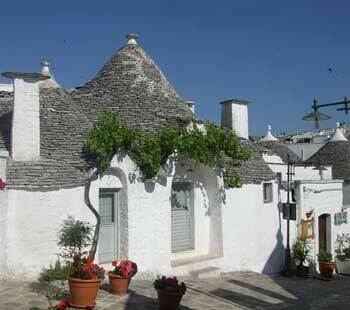 This is a trullo house on the grand scale, which is furnished with period fittings. It forms an interesting contrast to the smaller houses, and makes living in a trullo seem a very comfortable proposition. Unusually, it is a two-storey building. There are information boards with quaint English translations. A spy-hole next to the door allowed residents to inspect their visitors, and - according to the information board - in extreme cases to shoot any ill-intentioned arrivals. From the church a long street, Corso Vittorio Emanuele, leads down through town towards the main trulli areas. It's quite a gracious street with a few bars, shops and restaurants dotted along it, and is much favoured by the elderly men who pass their time in small groups on benches and pavements. The main town square, Piazza del Popolo, is a pleasant open space with tables and benches for watching the world go by. Just beyond this, next to the Church of Santa Lucia, is a belvedere offering good views over the trulli, which seem even more pixie-like and weird when viewed en masse like this. Nearby is the town museum, the Museo del Territorio. This is a rather fabulous structure of over ten combined trulli. It contains small displays of agricultural and building equipment, a couple of rooms recreated in period style which give a good idea of how inhabitants used to live, and some spires from the tops of trulli. Alberobello has a few other small museums, as well as the many trulli which bill themselves as museums or show trulli but are basically just souvenir shops. There is a Museum of Olive Oil, a Museum of Wine and a Museum of Handicrafts. Since the tourist industry here is still developing, one suspects that there will soon be more. The main tourist information office is at the Casa D'Amore, just off Piazza del Popolo. However when we visited the staff were not terribly knowledgeable, couldn't understand a desire to explore the local countryside on foot, and were able to provide no more information than a photocopied town plan with English notes. Around the main tourist area there are many little bars and snack-shops. There are also several restaurants and pizzerias, some in trulli and at least one with an outside terrace. Down on the main street, Largo Martellotta, are more typical Italian bars and a few small food shops. On Thursdays there is a great fruit and vegetable market here, where you can buy loads of local products, from watermelons (1 euro) to piles of cherries and chicory. It's a good place to stock up if you're planning a picnic. For a good sit-down meal, there are two restaurants close together in the town centre which do serve tourists, but at 'normal' prices and with excellent food. The Trullo d'Oro is in a trullo building. The cover charge is higher than normal but includes varied snacks and focaccia. Starters include a vegetarian selection of antipasti which won't leave much room for the local pasta dishes (Via Cavallotti 27, signposted from Corso Vittorio Emanuele). La Cantina, on the main street nearby, has the novelty of an open-plan kitchen/dining area so you can watch the chef preparing meals (Via Lippolis 8; on the corner of Corso Vittorio Emanuele). The best airports for Alberobello are Bari and Brindisi, both served by budget airlines from the United Kingdom. From Bari Airport you can simply catch a shuttle bus to Bari railway station then take a little train run by FSE (Ferrovie Sud Est) to Alberobello. At Bari station the FSE platforms are beyond the mainline platforms - facing the front of the station, take a flight of steps leading down under the rails, through an entrance on the left. There is a sign to Ferrovie Sud Est. They have a little ticket office on the platform. You'll probably need to ask to make sure you get on the correct small train - most travellers are regulars and there is little concern for announcements or signs. The journey takes under two hours and is very scenic: after skirting some hideous modern urban sprawl, the one-track railway line passes through olive groves and orchards, among which you begin to see the first white-painted trulli. 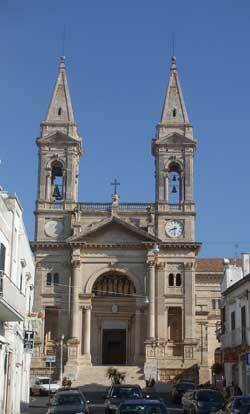 Brindisi Airport is close to Lecce, Puglia's other great tourist destination. Although it will take some planning as there may not be flights every day, if you are planning to visit both Alberobello and Lecce it may make sense to fly into one airport and out of the other. From Lecce there are little FSE trains heading towards Alberobello; check with station or train staff as you'll probably need to change in Martina Franca. If you are travelling directly from Brindisi Airport to Alberobello you begin by catching the local bus to Brindisi railway station, then getting a train. The rail journey takes around two hours, and entails two changes: at Francavilla Fontana (where you change onto the FSE line) and at Martina Franca. UK travellers will find the rail fares amazingly cheap: Alberobello to Bari, for example, cost just €4 in 2008. Station-masters are friendly and helpful: it's an old-fashioned service. Don't hesitate to ask if you have any doubts about which train/platform to choose. On Sundays trains are replaced by a bus service, and you'll need to buy your ticket in advance. The railway station in Alberobello is just a short walk - 5-10 minutes - from the centre of town. For Piazza del Popolo, head left along Via Mazzini and then continue straight along Via Garibaldi. If you're visiting on a day trip, this is a good place to start exploring. 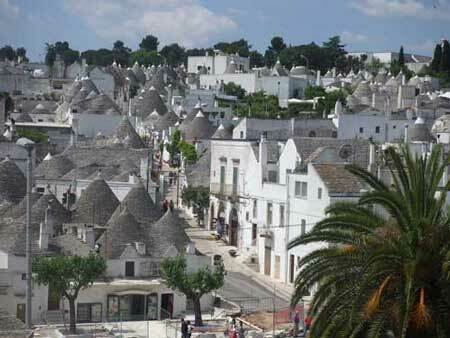 Alberobello is a fairly quiet little place and after a day wandering among trulli you may be ready for more exploring. This is much easier if you have a car, but it is also possible to make one or two excellent day trips by public transport. The little FSE trains only take a few picturesque minutes to reach Martina Franca, a pleasant whitewashed-and-baroque town. On the way they stop at Locorotondo which has a tiny historic centre on a hill with lovely views over the Valle d'Itria, a green landscape dotted with white trulli. Another stop on the railway line, back in the Bari direction, is Castellana Grotte, which is famous for its extensive and dramatic show caves, the Grotte di Castellana (outside the town). One of the most interesting day trips, though only really practicable if you hire a car, is Ostuni, one of the most well-known of the area's white hilltop towns. The best way to experience trulli is to stay in one. Rather than snatching a look around a trullo shop, you can get an idea of what a trullo is like as a home (and of course feel superior to day-trippers with plain and boring hotels). There are a few hotels which do have some trullo accommodation, but a comfortable and affordable alternative is to stay in a self-catering trullo apartment. There are a couple of firms which let out holiday trulli of various standards, some in the centre of Alberobello and some in the nearby countryside (a pleasant option if you have a car). 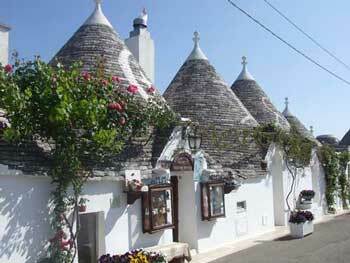 Trulli Holiday offers good-value trulli apartments and suites. The arrangement is somewhere between a 'scattered hotel' and self-catering properties: you arrive at their office, and are escorted through the streets to your own personal trullo where you stay independently with the bonus of breakfast provided at a town-centre cafe and a daily change of towels. I stayed in one of their Alberobello trulli a few years ago: read my review. The firm Trullidea offers a very similar range of accommodation options.